Loubet was born on 30 December 1838, the son of a peasant proprietor and mayor of Marsanne (Drôme). Admitted to the Parisian bar in 1862, he took his doctorate in law the next year. He was still a student when he witnessed the sweeping triumph of the Republican party in Paris at the general election in 1863, during the Second French Empire. He settled down to the exercise of his profession in Montélimar, where in 1869 he married Marie-Louise Picard. He also inherited a small estate at Grignan. 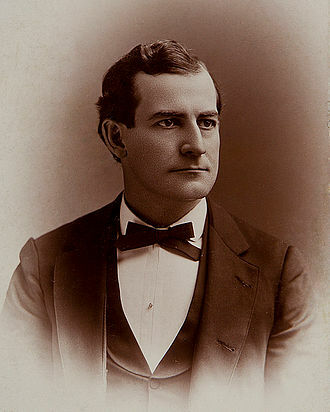 American politician William Jennings Bryan described Loubet as "below the medium height, even for Frenchmen. His shoulders are broad and his frame indicative of great physical strength. His hair is snow white, as are also his beard and mustache. He wears his beard square cut at the chin. . . . His voice is soft, and he speaks with great vivacity, emphasizing his words by expressive gestures." At the crisis of 1870, which brought about the Empire's end, he became mayor of Montélimar, and thenceforward was a steady supporter of Léon Gambetta. Elected to the Chamber of Deputies in 1876 by Montélimar, he was one of the notable 363 parliamentarians who in the 16 May 1877 crisis passed a vote of no confidence in the ministry of Albert, the duke of Broglie. In the general election of October he was re-elected, local enthusiasm for him being increased by the fact that the government had driven him from the mayoralty. 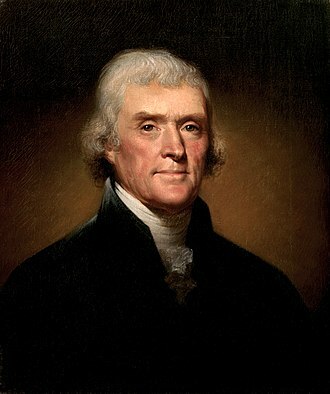 In the Chamber he occupied himself especially with education, fighting the clerical system established by the Loi Falloux, and working for the establishment of free, obligatory and secular primary instruction. In 1880 he became president of the departmental council in Drôme. His support of the second Jules Ferry ministry and his zeal for the colonial expansion of France gave him considerable weight in the moderate Republican party. He had entered the Senate in 1885, and he became minister of public works in the Tirard ministry (December 1887 to March 1888). In 1892 President Sadi Carnot, who was his personal friend, asked him to form a cabinet. 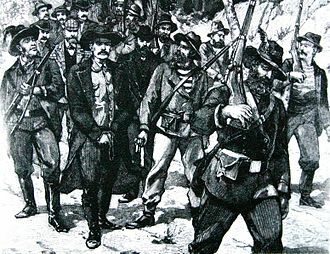 Loubet held the portfolio of the interior with the premiership, and had to deal with the anarchist crimes of that year and with the great strike of Carmaux, in which he acted as arbitrator, giving a decision regarded in many quarters as too favourable to the strikers. He was defeated in November on the question of the Panama scandals, but he retained the ministry of the interior in the next cabinet under Alexandre Ribot, though he resigned on its reconstruction in January. His reputation as an orator of great force and lucidity of exposition and as a safe and honest statesman procured for him in 1896 the presidency of the Senate, and in February 1899 he was chosen president of the republic in succession to Félix Faure by 483 votes as against 279 recorded by Jules Méline, his only serious competitor. He was marked out for fierce opposition and bitter insult, as the representative of that section of the Republican party which sought the revision of the Dreyfus affair. On the day of President Faure's funeral Paul Déroulède met the troops under General Roget on their return to barracks, and demanded that the general should march on the Elysée. Roget sensibly took his troops back to barracks. At the Auteuil steeplechase in June, the president was struck on the head with a cane by an anti-Dreyfusard. In that month President Loubet summoned Waldeck-Rousseau to form a cabinet, and at the same time entreated Republicans of all shades of opinion to rally to the defence of the state. By the efforts of Loubet and Waldeck-Rousseau the Dreyfus affair was settled, when Loubet, acting on the advice of General Galliffet, minister of war, remitted the ten years' imprisonment to which Dreyfus was condemned at Rennes. Loubet's presidency saw an acute stage of the clerical question, which was attacked by Waldeck-Rousseau and in still more drastic fashion by the Combes ministry. The French ambassador was recalled from the Vatican in April 1905, and in July the separation of church and state was voted in the Chamber of Deputies. Feeling had run high between France and Britain over the mutual criticisms passed on the conduct of the South African War and the Dreyfus affair respectively. These differences were composed, by the Anglo-French entente, and in 1904 a convention between the two countries secured the recognition of French claims in Morocco in exchange for non-interference with the British occupation of Egypt. President Loubet belonged to the peasant-proprietor class, and had none of the aristocratic proclivities of President Faure. 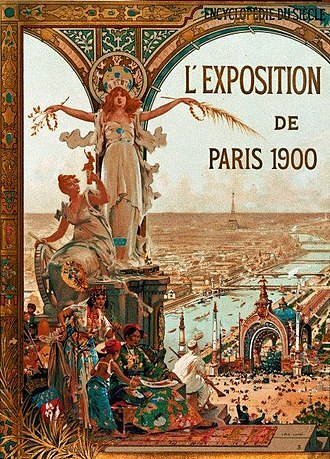 He inaugurated the Paris Exhibition of 1900, received the Tsar Nicholas II of Russia in September 1901 and paid a visit to Russia in 1902. On 4 July 1902 President Loubet was elected an honorary member of the Rhode Island Society of the Cincinnati. Loubet also exchanged visits with King Edward VII, with the king of Portugal, the king of Italy and the king of Spain. During the king of Spain's visit in 1905, an attempt was made on his life, a bomb being thrown under his carriage as he and with his guest left the Opéra Garnier. 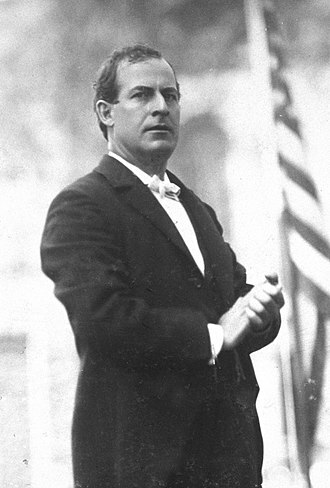 When his presidency came to an end in January 1906, he became the first President of the Third Republic to have served a full term and without resigning a second one. He retired into private life and died on December 20, 1929 at the age of 90. Kingdom of Belgium: Grand Cordon of the Order of Leopold; 1900. Kingdom of Bulgaria: Grand Cross of the Order of Saint Alexander - insignia in diamonds presented in 1902. Russian Empire: Knight of the Order of St. Andrew the Apostle the First-Called. Spain: Knight of the Order of the Golden Fleece - 22 June 1902 - invested by the Duke of Sesto, special representative of the Spanish King, in a ceremony in Paris. 8 March 1892 – Godefroy Cavaignac succeeds Roche as Minister for the Colonies. Roche remains Minister of Commerce and Industry. ^ Bomb for Loubet and King Alfonso; New York Times; 1 June 1905; p. 1; Note: Regarding an error in reporting: The New York Times article does in fact give their later destination as the "Palais d'Orsay", however, that building had burned down in 1871. ^ "Latest intelligence - France". The Times (36801). London. 23 June 1902. p. 5. This article incorporates text from a publication now in the public domain: Chisholm, Hugh, ed. 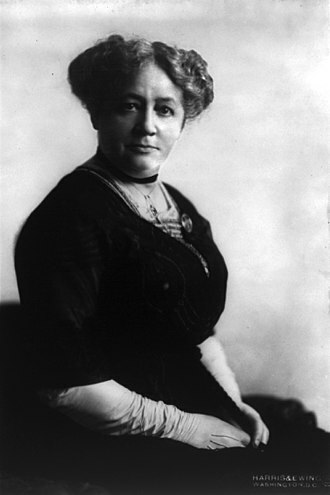 (1911). "Loubet, Émile François" . Encyclopædia Britannica. 17 (11th ed.). Cambridge University Press. p. 26. Wikimedia Commons has media related to Émile Loubet. Beach, Chandler B., ed. (1914). "Loubet, Émile" . The New Student's Reference Work . Chicago: F. E. Compton and Co.
Named for the Minister of Education Alfred de Falloux, they mainly aimed at promoting Catholic teaching. The 1851 law created a system, in which some primary education establishments were public and controlled by the state. The new law opened an era of cooperation between Church and state that lasted until the Ferry laws ended this in the early 1880s, the Falloux laws provided universal primary schooling in France and expanded opportunities for secondary schooling. In practice, the curricula in Catholic and state schools were similar, Catholic schools were especially useful in schooling for girls, which had long been neglected. This aim was achieved, the Falloux Law created a mixed system, public on one hand. This law allowed the clergy and members of orders and female. This exemption was extended even to priests who taught in secondary schools, the primary schools were put under the management of the curés. The Falloux Law created one academy for each department, decentralising the University and it reorganised the Superior Council of Education and academic councils, specifically by giving a large number of places to representatives of various religions, above all of Roman Catholicism. Similarly, bishops were included in the academic councils and secondary education were divided between state establishments, and private establishments, headed by non-profit organisations or religious congregations. Supervision of schools was the joint responsibility of the mayor and the priest and they thought that the imperial education system, inherited from the First Empires reforms, excessively diffused Enlightenment and socialist ideas. Thus, they wanted the system to return to its basis during the Ancien Régime. 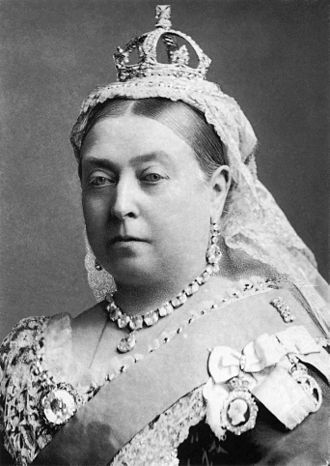 However, the July Monarchy was much less friendly to this reactionary trend, although the Guizot Law of 1833 partially satisfied Catholics by authorising private teaching in primary education, it kept secondary and higher education under the Universitys supervision. Guizot generalised the écoles normales primaires, which were responsible for the training of teachers, after the 1848 Revolution, Lazare Hippolyte Carnot was named Minister of Public Instruction and prepared a draft reform. The Dreyfus Affair was a political scandal that divided the Third French Republic from 1894 until its resolution in 1906. The affair is often seen as a modern and universal symbol of injustice, the major role played by the press and public opinion proved influential in the lasting social conflict. The scandal began in December 1894, with the conviction of Captain Alfred Dreyfus. After high-ranking military officials suppressed the new evidence, a military court unanimously acquitted Esterházy after a trial lasting two days. The Army accused Dreyfus with additional charges based on falsified documents, activists put pressure on the government to reopen the case. 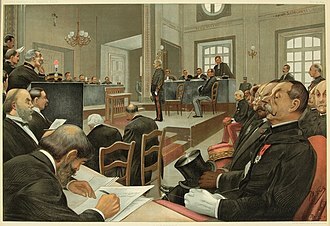 In 1899, Dreyfus was returned to France for another trial, the new trial resulted in another conviction and a 10-year sentence, but Dreyfus was given a pardon and set free. 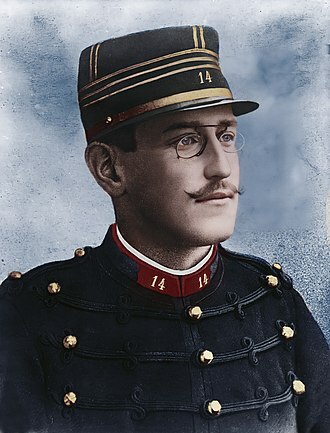 Eventually all the accusations against Dreyfus were demonstrated to be baseless, in 1906 Dreyfus was exonerated and reinstated as a major in the French Army. He served during the whole of World War I, ending his service with the rank of lieutenant-colonel, the affair from 1894 to 1906 divided France deeply and lastingly into two opposing camps, the pro-Army, mostly Catholic anti-Dreyfusards and the anticlerical, pro-republican Dreyfusards. 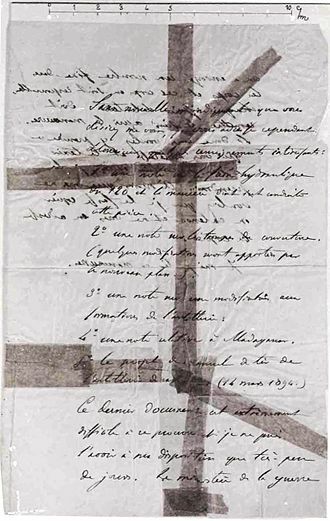 It embittered French politics and encouraged radicalization, the museum created an online platform in 2006 dedicated to the Dreyfus Affair, giving the public access to these documents. 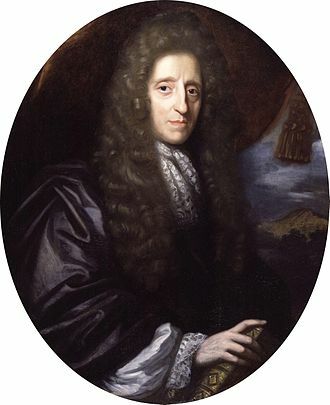 After a closed trial, he was guilty of treason. He was deported to Devils Island, at that time, the opinion of the French political class was unanimously unfavourable towards Dreyfus. Certain of the injustice of the sentence, the family of the Captain, through his brother Mathieu, meanwhile Colonel Georges Picquart, head of counter-espionage, found evidence in March 1896 indicating that the real traitor was Major Ferdinand Walsin Esterházy. The General Staff, refused to reconsider its judgment, in July 1897 his family contacted the President of the Senate Auguste Scheurer-Kestner to draw attention to the tenuousness of the evidence against Dreyfus. 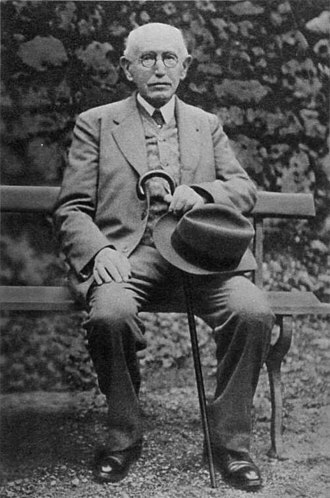 Scheurer-Kestner reported three months that he was convinced of the innocence of Dreyfus and persuaded Georges Clemenceau, in the same month, Mathieu Dreyfus complained to the Ministry of War against Walsin-Esterházy. Known today as the Dreyfus affair, the incident eventually ended with Dreyfus complete exoneration. 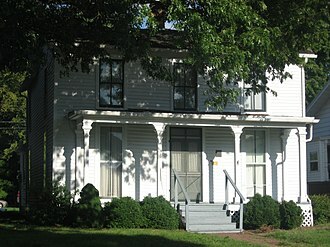 The museum created a platform in 2006 dedicated to the Dreyfus Affair. Born in Mulhouse, Alsace in 1859, Dreyfus was the youngest of nine born to Raphaël. Raphaël Dreyfus was a prosperous, self-made, Jewish textile manufacturer who had started as a peddler, alfred was 10 years old when the Franco-Prussian War broke out in the summer of 1870, and his family moved to Paris following the annexation of Alsace-Lorraine by Germany after the war. The childhood experience of seeing his family uprooted by the war with Germany prompted Dreyfus to decide on a career in the military. Following his 18th birthday in October 1877, he enrolled in the elite École Polytechnique military school in Paris, where he received military training, in 1880, he graduated and was commissioned as a sub-lieutenant in the French army. From 1880 to 1882, he attended the school at Fontainebleau to receive more specialized training as an artillery officer. 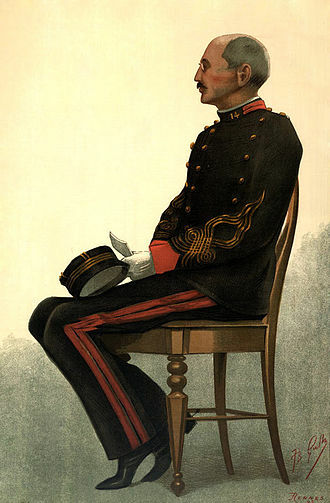 On graduation he was assigned to the Thirty-first Artillery Regiment, which was in garrison at Le Mans, Dreyfus was subsequently transferred to a mounted artillery battery attached to the First Cavalry Division, and promoted to lieutenant in 1885. In 1889, he was adjutant to the director of the Établissement de Bourges, a government arsenal. On 18 April 1891, the 31-year-old Dreyfus married 20-year-old Lucie Eugénie Hadamard and they had two children and Jeanne. 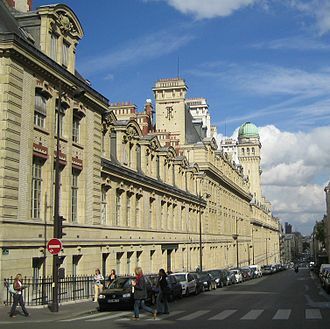 Three days after the wedding, Dreyfus learned that he had admitted to the École Supérieure de Guerre or War College. His father Raphaël died on 13 December 1893, at the War College examination in 1892, his friends had expected him to do well. However, one of the members of the panel, General Bonnefond, felt that Jews were not desired on the staff, Bonnefonds assessment lowered Dreyfus overall grade, he did the same to another Jewish candidate, Lieutenant Picard. 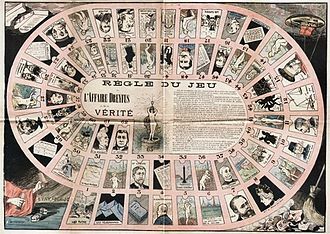 The protest would count against Dreyfus, the French army of the period was relatively open to entry and advancement by talent with an estimated 300 Jewish officers, of whom ten were generals. French Army Lieutenant Paul Déroulède, painted in 1877 by Jean-François Portaels. Duel between Georges Clemenceau and Paul Déroulède. A 1904 French postcard showing Britannia and Marianne dancing together, symbolizing the newborn cooperation between the two countries.